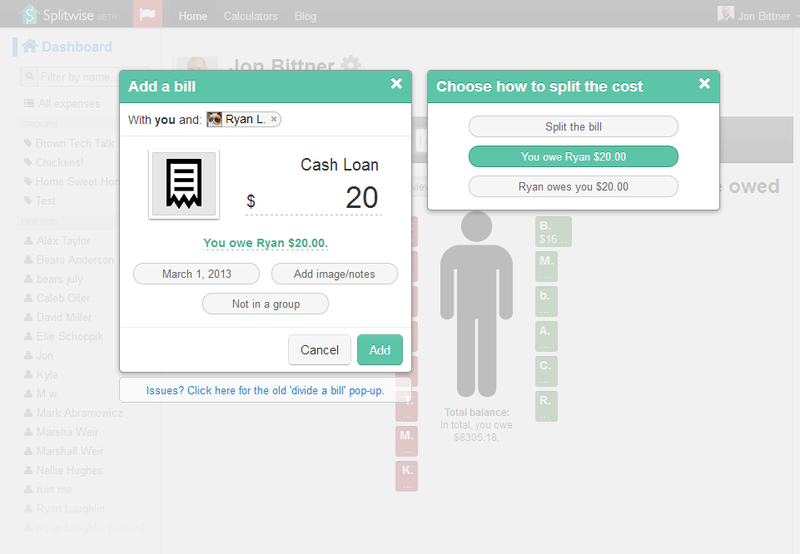 We’ve been dying to improve our “Divide A Bill” dialog box for months, and a preliminary version is finally ready! Take a look below, and please give us feedback or suggestions in the comments. We’ve been rolling it out slowly over the past few days, and all users will have it by early next week. Now with auto-complete, and the ability to change the involved parties without clearing out data. The form has been completely redesigned from scratch, with two killer new features. You can add people into the “With’ field just like an email – without tons of clicking. SO much easier, and much more like the iPhone and Android apps. Adding new people will automatically add them into the expense without clearing your existing data (a big complaint in the old version). If for some reason you hate this new form, a) please tell us why! and b) there will still be a link to the old “Divide A Bill” form for little while, as you can see in the screenshot. You can turn a bill into an IOU by clicking on the text link “Split equally” and changing it to an IOU. Unfortunately, itemized bills still link to the old form (and clears your data – sorry! ), which we will definitely be updating as soon as we can. Itemized expenses are surprisingly complicated to support with all of the snappy AJAX and auto-complete goodness. All in a days work! 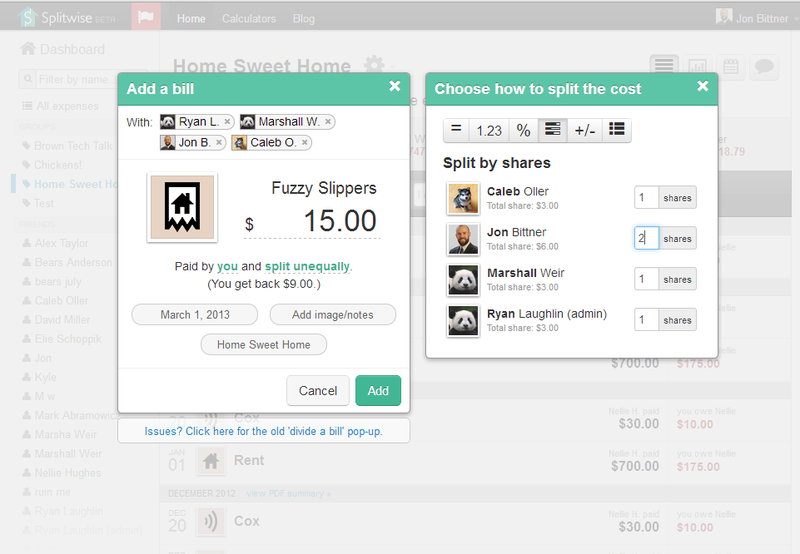 1) You can export any group or friendship on Splitwise to a .csv spreadsheet file (readable by Excel). Just navigate to the relationship that you wish to export, choose “Other actions” from the menu, and click “Export as spreadsheet”. I’m sorry you can’t export everything at once – we do plan on adding that feature back in at some point, but we are changing a lot of back-end stuff so we want to wait till we release a new version before doing so. 2) The apps and website should support multiple currencies already – there are a few minor bugs which we’re hoping to correct in the next version, so let us know if you see anything unusual? There is a default currency in your user settings, and each expense can have its own currency as well. 3) This is also a user setting – it’s not enabled by default (to avoid spamming people), but you can turn it on your user settings page. Will surely come back for few more options may be either in term of usability perspective or some other ..
Will the “split by shares” option be coming to the iPhone app? I frequently travel with a mix of couples and singles and this would REALLY help me out! Looking for split percentage on the iPhone as well! Also, would be nice to have a default percentages that will apply to members in a group, instead of assuming the group is 50/50. Every single expense in our group is split 66% / 34%, but we have to remember to enter the % for every single expense when we enter it on the web, and manually figure the amounts on the iPhone. Both great suggestions, and thanks for writing! We’re working hard to improve the entire design of the new app, and these features would definitely be helpful – I would use divide by shares on the phone myself a fair bit, and saved % within a group is also a really cool power feature we’ve planned to add for a long time, but keeps getting pushed back due to pressing stuff. I can’t make any specific promises, but those are bothideas we’d like to do! There is some chance we will get the divide-by shares and/or % features in, but less of a chance we will get saved split-percentages in this upcoming “3.0” release. Feel free to check out our feedback forums at http://feedback.splitwise.com and vote or create all your ideas for Splitwise – this is the tool we use to help us prioritize, because we have so many requests and only 4 full time people to work on all of them, plus all the stuff we want to do. If i have two roommates, and only one splits a bill with me – does the other roommate in our group see this expense? eg: Jon and Joe and Beth live in a household. Beth and Joe split cable. Does Jon see this on the house groups landing page? Sorry for the slow reply: Yes and no. If you add a bill to a group (the website will say “Filed Under XXXX” where XXXX is the name of your house), everyone in that group will see it. If you add it just between you and her, only you two will see it. I hope this helps clarify, and always feel free to write support@splitwise.com if you have any more detailed questions.